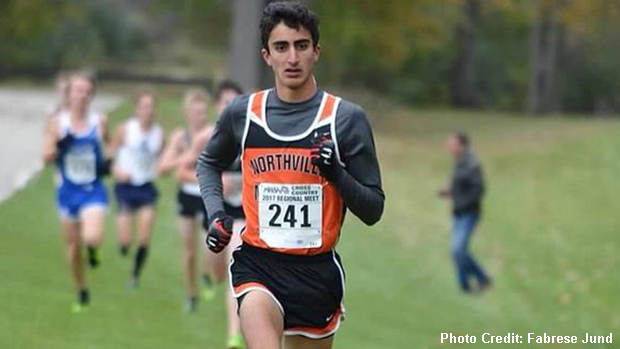 Northville's Nicholas Couyoumjian shown during cross country competition. High level track and field action took place at this past weekend's KLAA Championships, which was hosted by Canton. Northville's Yasmine Mansi took the win in a spirited 1600m contest that saw the top five finishers all run under 5:10. Mansi claimed first place due to her 5:03.62 effort. Yasmine Mansi also secured the 3200m win with her time of 11:06.11. The freshman is ranked fourteenth in Michigan from a previous result this season (10:49.98 at the Golden Triangle Invitational). Salem's Haven Essien won the 100m hurdles race with her time of 14.96. In field event action, Paige Sanders of Plymouth won the long jump with a leap of 18-7 and Canton's Victoria Faber took the pole vault win with her vault of 11-6. Sanders' result represents a Michigan No. 1 for the 2018 outdoor season. Faber is ranked in a tie for second in the state from her 12-1 effort at the Plymouth vs Canton dual meet on May 8th. On the boys side, Northville's Nicholas Couyoumjian recorded a time of 1:57.12 to place first in the 800m event and Sharriff Dyer of Salem clocked 39.15 on route to winning the 300m hurdles race. Grand Blanc's Aidan Martini won the discus event due to his throw of 151-9. The top eight finishers all went sub 4:30 in the 1600m contest with Novi's Gabriel Mudel leading the way with his impressive 4:19.04 showing. Mudel also won the 3200m race due to his time of 9:29.75. Check out the 1600m action from both heats 1 and 2!